I love picture books. Three of my children are very independent readers now and while they like to be read to, they want a chapter book with characters and plots. But I love cuddling my youngest and reading picture books to her. She will bring books to anyone that she thinks might read to her. She carries books around in her "purse". 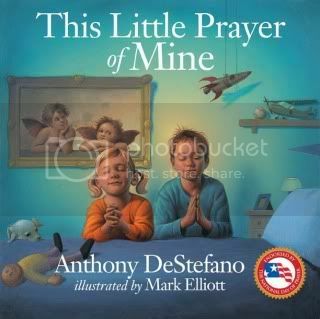 So of course I jumped at the chance to read and review This Little Prayer of Mine by Anthony DeStefano (and illustrated by Mark Elliott). First, I love that the book promotes prayer in children. Teaching children that their concerns, cares and even their gratitude needs to be taken to their Heavenly Father on a regular basis is very important. Think of the heartaches that can be later avoided in life if we depend on Him instead of earthly people. (I learn the hard way...) It also encourages children to be confident in God hearing them when they pray. Still, a nice book to have in a collection. The books is endorsed by The National Day of Prayer. Anthony DeStefano's books The Prayers God Always Says Yes To and A Travel Guide to Heaven have sold a quarter-million copies. He has received prestigious awards from religious organizations worldwide for his efforts to advance Christian beliefs in modern culture. Mark Elliott's brilliant illustrations have appeared in any picture books and novels for young readers, including Gail Carson Levine's ever-popular Princess Tales series. His acclaimed artwork delivers inspiration, wonder, and timeless beauty on every page. This book was provided by WaterBrook Press for review. And I have a copy to give away. Has nobody commented, really? I came the day after the giveaway was to end and figured you'd had a comment on facebook. I would LOVE this!!! !